Republican presidential candidate and New Jersey Gov. 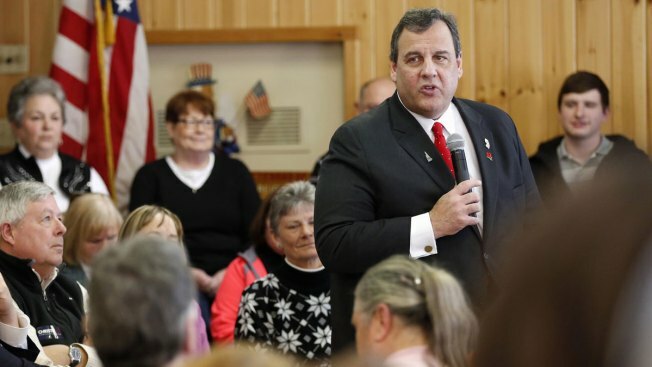 Chris Christie speaks during a campaign stop in Littleton, New Hampshire, on Friday, Jan. 22, 2016. Republican presidential candidate and New Jersey Gov. Chris Christie is back in New Hampshire after leaving the campaign trail as a historic blizzard battered the region and flooded parts of the Jersey Shore. The governor returned to his home state from New Hampshire Friday as the region braced for impact. Parts of New Jersey saw more than 2 feet of snow and record storm surges left southern coastal towns underwater. Christie, however, said the flooding wasn't as bad as it could have been. The governor said minor to moderate flooding occurred during Sunday morning's high tides, mostly in Atlantic and Cape May counties. Several roads and neighborhoods had been flooded, but officials said the waters were starting to recede by late Sunday morning. No major damage from the flooding was reported, and only some residents were displaced. Utility companies reported early Sunday afternoon that roughly 20,500 customers were still without electricity, but officials expect all service will be restored by late Sunday night. Christie will make stops in Portsmouth and Hampton on Sunday afternoon and will be in Greenland, Merrimack and Hooksett Monday morning. He's one of several candidates doubling down on their efforts in New Hapshire ahead of the state's primary Feb. 9.